(4) Figures to the right indicate full marks. 1 (a) Two concurrent forces P and Q acts at O such that resultant acts along x-axis. Determine the magnitude of Q and hence the resultant. 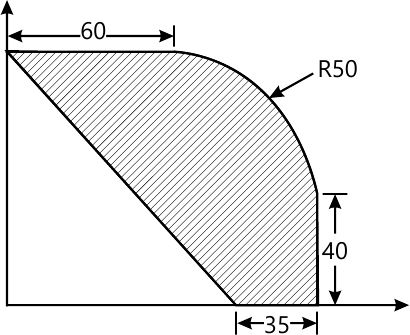 (4 marks) 1 (b) A cylinder with 1500 N weight is resting in an unsymmetrical smooth groove as shown in figure. Determine the reactions at the point of contacts. 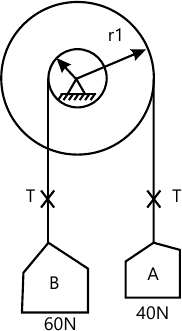 (6 marks) 2 (b) Two cylinder are kept in a channel as shown in figure. Determine the reactions at all the contact points A,B,C and D. Assume all surfaces smooth. (8 marks) 2 (c) A ball of mass 'm' hits directly to a similar ball of mass 'm' which is at rest. The velocity of first ball after impact is zero. Half of the initial kinetic energy is lost in impact. Find coefficient of restitution. 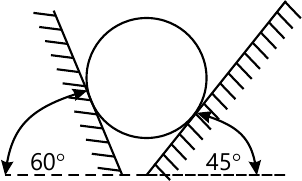 (6 marks) 3 (a) Determine the Centre of gravity of the shadded area. 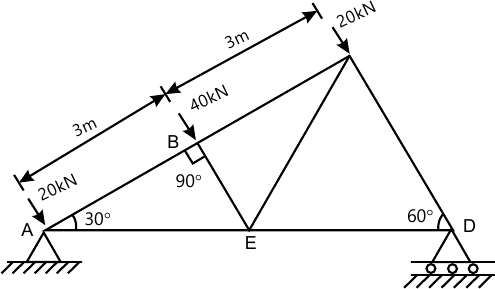 (8 marks) 3 (b) The lines of action of three forces concurrent at origin 'O' pass respectively through points A(-1,2,4), B(3,0,-3) and C(2,-2,4)m. The magnitude of forces are 40N, 10N and 30N respectively. Determine the magnitude and direction of their resultant. (6 marks) 3 (c) A 30N block is released from rest. It slides drown a rough incline having coefficient of friction 0.25. determine the maximum compression of the spring. 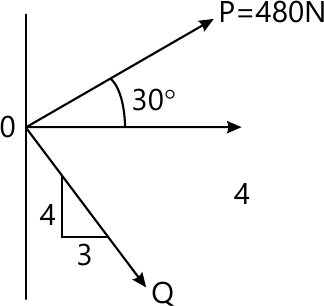 (6 marks) 4 (a) Find the support reaction at B and the load P, for the beam shown in figure if the reaction at support A is zero. (8 marks) 4 (b) A gunman fires a bullet with a velocity of 100m/s 50? upwards from the top of a bill 300m high to hit a bird. The bullet misses its target and finally lands on the ground. 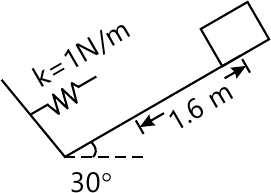 Calculate (a) the maximum height reached by the bullet above the ground (b) total time of flight (c) velocity with which the bullets hits the ground. (6 marks) 4 (c) In the mechanism shown the angular velocity of link AB is 5 rad/sec anticlockwise. 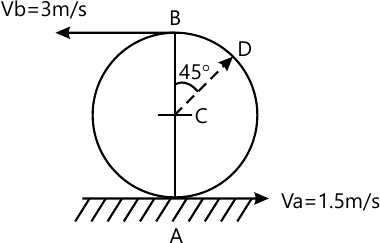 At the instant shown, determine the angular velocity of link BC velocity of piston C.
(8 marks) 5 (b) Due to slipping points A and B on the rim of the disk have the velocity as shown in figure. Determine the velocity of the centre point C and point D on the rim at this instant. Take radius of disk 0.24m. (6 marks) 5 (c) A particle moves in a straight line with a velocity-time diagrams shown in figure. If S=-25m at t=0, draw displacement time and accelerator time diagrams for 0 to 24 seconds. (8 marks) 6 (b) A force of 1200N acts along PQ, P(4,5,-2) and Q(-3,1,6)m. calculate its moment about a point A(3,2,0)m(4 marks) 6 (c) A point moves along the path y=x2/3 with a constant speed of 8m/s. What are the x and y component of the velocities when x=3. What is the acceleration of the point when x=3. 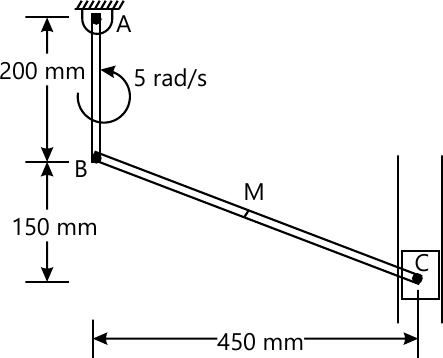 (4 marks) 6 (d) A two step pulley support two weights A=40N and B=60N as shown. 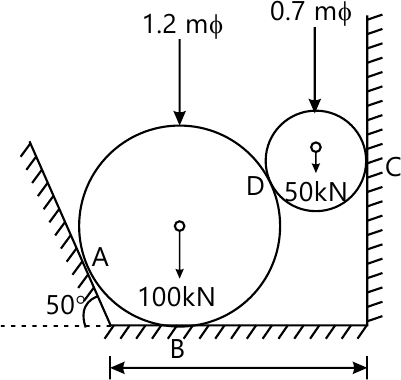 Find the downward acceleration of A if radius of bigger pulley is double that of the smaller one. 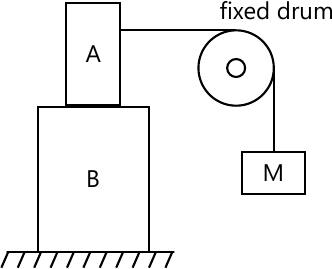 Neglect friction and inertia of pulley.